People’s Improv Theater presents a bawdy parody of the classic 1950s-themed musical. The musical comedy “Grease 3: Threase!” seen Feb. 4 at the People’s Improv Theater, opens with the energetic performers singing like they were trying to make up for lost time, as though they were not the stars of their high school play, but damn it, now they were gonna rip loose like they had something to prove! 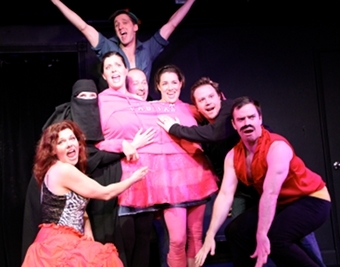 The play’s creators set the spoofing tone by introducing the T-Boners and the Pink Labias as the boy/girl gangs of Schmydell High. The opening song has the T Boners, our high school boy gang, checking into to what happened to “Macaroni,” the bad boy, over summer vacation. It has the all the flavor of the original “Grease” except with vulgarities and summer activities such as shark punching -- so 21st century! A very funny bit repeated throughout the show is that the characters are high school seniors, but the fact that the actors all appear to be about 30 shouldn’t distract you. “Threase” has counterparts to all the classic “Grease” characters -- the bad boy, the pregnant chick who doesn’t know it, the skanky gal with her counterpart skanky boyfriend who frequently engage in over-the-top bouts of PDAs (public displays of affection, for those of you not acquainted with the term). And of course, Siamese twin sisters. All of them are going to be in a talent show so it’s a good thing you are sitting down for this. Amongst the chaos, the talent show must go on, and so does throwing in a paso doble, a baby’s birth and a brief burka breakdance. Shayna Ferm, playing the unknowingly pregnant senior, is a standout in the cast, and has a number in which she sings that she is just fat! Her line, “there’s nothing growing in my box,” may haunt me for awhile. She had a great voice and excellent comedic timing. Even if you don’t know anything about the original “Grease” movies, you will enjoy this energetic send-up. It moves quickly, the energy is consistently high throughout the songs, the dialogue is snappy and the jokes quite dirty. Your attention doesn’t have time to wander! Running for 45 minutes, it is a sharp comedy piece that justifies its running time and never drags. “Grease 3: Threase!” returns to The PIT at 8 p.m. Fridays, Feb. 11, 18 and 25.